Home slaughtering is a traditional Australian pastime with a rich history in Australian literature, film, television, theatre and music. The most popular animals for home slaughter are kangaroo, emu, wild pig and platypus, though home slaughtering of sheep, cattle, buffalo, chickens and crocodiles is not uncommon in metropolitan areas. Australian children are usually given their first home-slaughtering kit (knives, apron, white gumboots and chain-mail glove) on the first Australia Day (January 26) after their fourth birthday. The traditional ceremony usually involves a parent or older sister holding down a small feral camel while the child cuts its throat. The whole family then joins in gutting the beast, using wicketkeepers' gloves to load the entrails into a wheelbarrow, which is then tipped over the neighbour's fence. The whole family then goes out for a celebratory meal of Chiko Rolls and blue fizzy drinks. 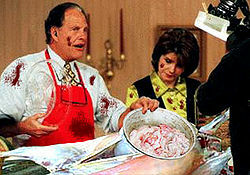 Home slaughtering has been a staple of Australian television since 1956. All commercial networks have at least one prime-time slaughtering show, and children are up at garbo's fart on Saturday mornings to watch Humphrey B. Bear's Abattoir Hour. The recent SBS reality TV series Celebrity Slaughterhouse, which featured well-known Australians Germaine Greer, Clive James, Darren "Boofhead" Lehmann, and Elle MacPherson taking the stainless steel to rabbits, dugongs, fairy penguins, goannas and brumbies (wild horses) broke all ratings records in Australia, New Zealand and Papua New Guinea. A second series has just been commissioned. More enduring home slaughtering-themed works of Australian art include Patrick White's novel Among the Entrails, Paul Hogan's Crocodile Dundee cycle and the classic AC/DC album She Didn't Catch that from Gutting a Wallaby.